Well balanced and picturesque, along the White River. Many technical woodsy holes, a few longer open ones. Mild elevation. More info downtown at Mandos Disc Golf Shop. I-5; exit to Hwy 18 east, 7 miles, exit at Auburn Way (Hwy 164). Left (south) on Auburn Way. Stay to the right when road splits. Right at stop sign on R St., 1.2 miles to a left on Stuck River Dr., then take 1st left into Game Farm Wilderness Park. 1st tee near north end of parking lot. WRDGC is easy to get to. Located in Game Farm Park and about 30 minutes from Tacoma and 40 from Seattle - what a great course to learn on and also a challenging course for competition ams and pro players alike. I have now played a variety of courses in the Northwest from California up and WR offers a good blend of challenging short and technical as well as long and open play. It's a beautiful environment situated along the river with one hole near the waters edge and most times if it rains lightly you still stay fairly dry due to the tree cover. Just 5 minutes from food and other services and also has a great little campground and bathrooms if you want to stay awhile. Tee pads and holes have gotten recent improvements like directional signage, mulch barking on the pathways and a few new tee pads as well as a few new basket positions. This is a real favorite of many, well maintained with long and short tees - hit this track and you'll keep coming back. White River has most of the things I look for in a good course. Beautiful setting, well maintained, mix of long and short holes, mix of open and wooded fairways, and a variety of shots. Great course for beginners and experienced players with double tees and pin placements on most every hole. Playable in the rainy seasons as well, which is nice for the NW. Would be nice to have bigger boxes for the longer holes and signs/distances at the tees as well. Nice paved parking lot, bathrooms, a practice putting basket, and a kiosk are right at hole 1. There is also several picnic areas and great camping at this park. The course is a gem. It forces you to bring all your shots. It has some open shots but mainly winds in the woods and along the White River. The only thing this property lacks is elevation. It more than makes up for that with variety and beauty. There are good signs but the course changes from Summer to Winter. The winter course uses a large field that is used by other park users in the summer. Many holes have 2 pin placements and almost all the holes have 2 tee positions. Most tee boxes are concrete. Great family course. 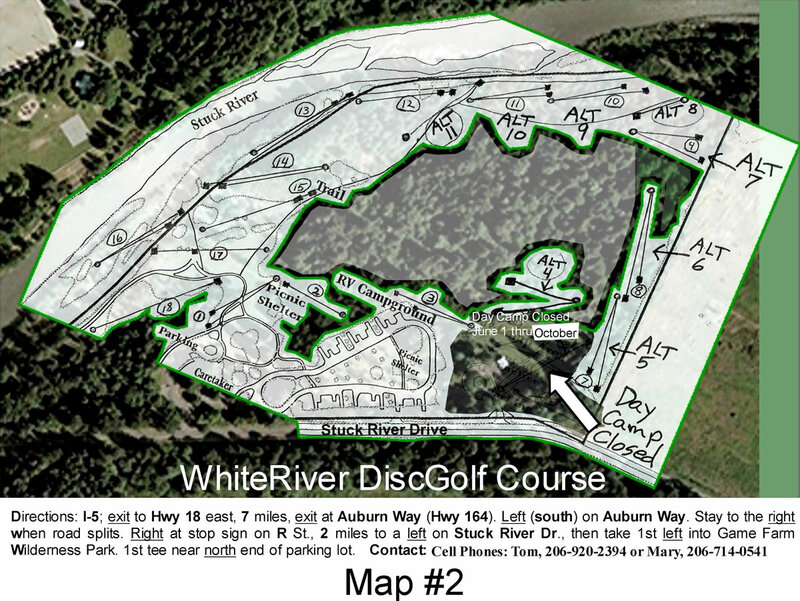 I recently moved up here from California and have only played Yauger Park in Olympia, Fort Steilacom in Steilacom, and Riverside in Sumner, but out of all of them White River is my favorite! Very well marked and well maintained! I have played a few of the courses in the Northwest and this one is my favorite in the general area of Seattle. It is clearly marked - good tee signs - not confusing to navigate. Good tee pads. There are quite a few tight holes and a good mix in of open ones also. Some holes play along the aptly named White River. There is elevation on some holes and a good mix of longish holes to complement the short tight ones. I am a White River fan!